Kits is an older this dog. This past winter his age has really caught up with him. But I really want to give him one last summer. He is such a neat dog. He never had any of the bad traits of his breed. Kits has always basically been to lazy to act up. 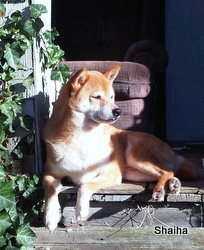 Shiba Inus are known for being aloof dogs that really don't like people other then their owners and sometimes not even them. Kits however has always loved everyone. We used to take him to pet fairs some that people could see the breed but we would have to warn them that he isn't a typical Shiba. So things are tense and will be until we find out what is going on. Oh, we love our animals, don't we? Sending good healing thoughts and vibes to Kits today!